Can you remember your favourite childhood film? I thought I could. Ask me and I'd reel off about ten awfully cliched Disney classics, probably ending with a well rehearsed "but my all time favourite has to be The Little Mermaid". I guess I felt some affinity with Ariel. Quite worrying really when said character is a sea-living, crab-befriending fish-girl. Well, at least you can't say my aspirations were unimaginative. Nevertheless, it is only now that I can actually remember a film that captured my heart far more tightly than Ariel ever could. It was The Secret Garden. Full of dark corners, secret rooms and enchanting friendships, this film was made for daydreaming, adventure seeking little girls. And I was one of them. And the catalyst for this sudden reminder? A little jaunt to the theatre to see it on stage. I feel embarassed, ashamed almost, that such a wonderful story slipped my mind on those countless occasions. The play was just beautiful. Wonderful actors, wonderful scenery, and of course, a wonderful storyline. I wore my floral playsuit, [quite aptly really but completely unplanned!] chunky cardigan and worker boots. I'm never sure how to dress for the theatre - a night time showing is bad enough, but this was a matinee and thus proved even more confusing. To dress up or down? To jean, or not to jean?! Love this outfit, so lovely :) The boots are yummy! & I have that cardie- wooo! The Secret Garden was my favourite film when I was little too, I just adored the whole idea of it. I still love watching it now as well! Oh yes, it was the Secret Garden for me, too! Steph - yay for the cardi! I never saw a film of alice in wonderland til the 3d one 2bh! Alexandra - so glad someone else can remember it, such a good film. Ooo, the theatre. Hope you had fun! I'm off to see something next week. I never saw The Secret Garden. I absolutely loved the book though. You picked a great outfit. 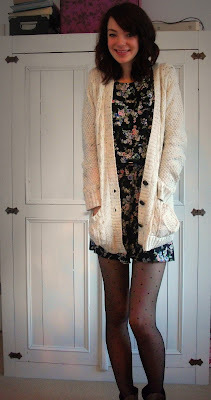 I love the cardi. And the feather ring is gorgeous. Sherin - I do like the theatre...don't get to go very often but it certainly makes a nice change :) The feather ring was actually in the sale - woop! I love your playsuit - the pattern is gorgeous and so perfect for The Secret Garden. I loved the book and *adored* the film, it was so beautifully shot. I still like the idea of dressing up for the theatre, even if we don't get out our opera clothes so much any more! A matinee is definitely a more relaxed performance though, so I think your look is perfect. I loooove the Secret Garden! I'd forgotten all about it so thank you for reminding me. Yes, its very easy to divert straight to Disney when someone teams the word 'childhood' with 'inspirational', but I think there are a lot of hidden gems out there that I've kind of forgotten because they've been beaten out of my mind by talking dogs and friendly candlesticks. Harriet - The film really was beautiful wasn't it?! Like a piece of art. Sarah- thanks! It's the only one I've got but they're so comfy i wish i had more! Lil- Don't get me wrong, those talking dogs and friendly candlesticks are incredible...but they have made me forget a ton of other characters/films that are so much better! I adoreeee your outfit! perfection <3 my favorite childhood film was Pocahontas! Ooooh Pocahontas is a good'un! Definitely the best soundtrack, such beautiful music. and i loved the secret garden, but i was a very 'girly girl' and was more into my barney! This is a bit of a random comment - but I just had to say: I wore that exact same playsuit, & a VERY similar cardigan just yesterday! Heartshapedbruise- hehe, great minds think alike?! Beauty and the Beast is my mum's fave...gets her every time! hehe. And thank you love, I'm 6ft...JOY. Useful for seeing over things, not so great if you're having a bad hair day...there's no hiding! Emma Jade- thank you m'dear! I've gotta admit I could easily be converted to models own now- very impressed! But feel like I'm betraying Mr Barry M!